June 2011 - The Skorpion series of low-cost Ethernet infrastructure products just got smarter with the introduction of the EISK8M Skorpion Managed Switch. One 8-port 10/100 Mbps copper model, and three 8-port copper/fiber models are now available. Customers can now step up to a cost effective managed switch while maintaining the benefits of the Skorpion series. The Skorpion series, within the CTRLink line, consists of unmanaged Ethernet switches, media converters and IP routers. Intended for convenient mounting in control panels, they are very popular because of their low-cost, they are housed in a rugged metal enclosure, their compact design requires little DIN-rail space and they can share power with the control panel's common 24 VAC/VDC power supply. Intended for general purpose automation systems, the products are simple to use. The EISK8M Series is extremely compact and rated over the industrial temperature range. fiber optic distances up to 15 km are possible with the single-mode option. Each unit can be configured via its web pages – and can be powered either from a low voltage AC or DC source. The EISK8M Series provides standard plug-and-play features such as auto-negotiation and Auto-MDIX – allowing for quick and simple installation. However, these features plus full-duplex can be individually set for each copper port. Three models offer two fiber ports. You can choose single-mode transceivers with SC connectors (providing 15 km cable distance) or multimode transceivers with either SC or ST connectors. The copper ports can auto-negotiate 10 Mbps, 100 Mbps, half- or full-duplex. With Auto-MDIX, either straight-through or crossover cables may be used to connect any of the copper ports to similar ports on another switch. In addition to one power LED and one CPU status LED, each port has LEDs showing link/activity/data rate by colour: green for 100 Mbps and yellow for 10 Mbps. Flashing indicates port activity. The EISK8M Series is designed for DIN-rail mounting. There are several low-voltage AC or DC powering options from 24 VAC or from 10-36 VDC. Provisions exist for redundant power connections. 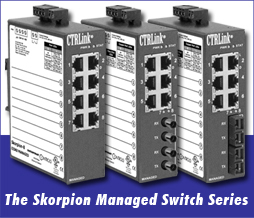 Visit the Skorpion Managed Switch product page for ordering information.